Stanford Advanced Materials (SAM) is a leading supplier of Gadolinium Sulfate and a wide range of high purity rare earth chemicals. Gadolinium sulfate is a rare earth compound of Gadolinium. 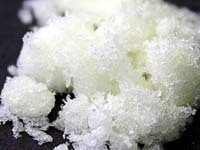 It is soluble in water and strong mineral acids. Sulfur has a yellow pigmentation and can readily be found in nature. Gadolinium is a rare earth element with a high magnetic moment. Due to its magnetic moment, Gadolinium is able to enhance signal intensity by reducing relaxation times. It is also used for semiconductor fabrication and nuclear reactor shielding. When combined with EDTA ligands, Gadolinium can be used as an injectable contrast agent for MRIs. A tailor-made solution is available. Our Gadolinium sulfate is carefully handled to minimize damage during storage and transportation and to preserve the quality of our product in its original condition.